QUESTION: If it comes down to two great rounds in a hunter class – one ridden by a professional trainer, and one by an Amateur or Junior – are there differences in the way the two rounds are judged? Judges will notice an experienced professional rider/trainer versus a less experienced young rider or adult as soon as he/she enters the arena. There are Michael Jordans and there are the others. 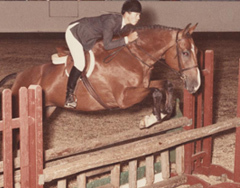 Class divisions are designed to separate non-professional riders called amateurs (because they do not earn a living from equestrian activities) and juniors from professional riders who earn their living as trainers. When judging a hunter class, does the judge take into consideration who is riding the horse (i.e., the experience level of the rider) ? We asked our judges.